Time-variable plots can be opened via the Outline View. When one or more items that are candidate subjects  for a time-variable plot are selected in the Outline View, it adds the Show XY Plot operation to its right-click menu. After requesting the plot, the user is invited to indicate which calculation is to be plotted, and which track is to be used as the primary track (where relevant).The example below shows the results of a Range calculation between two tracks. Note that dragging the mouse downwards in a rectangle inside the plot zooms in on the data, dragging the mouse upwards into a rectangle zooms out on the data, and that the Fit to Window button zooms out to show all of the current data. Where data is not present, a gap is inserted into the data-line. The Switch Axes button changes the orientation of the plot from its default format to a waterfall-style display with time plotted down the left-hand side. 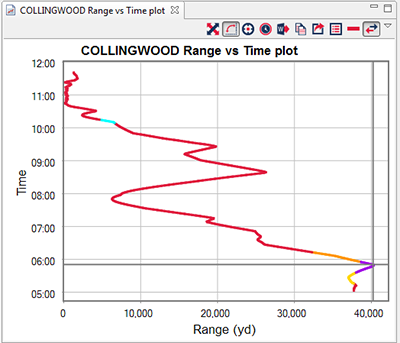 The Grow Times button changes the time axis to make the top of the waterfall display the current Time Controller time, with the data displayed changing dynamically with time slider..
RelativeTimes Whether to plot absolute or relative times (used when analysing time-zero data). See Section 4.4, “Show time-related variables” . DisplayFixedDuration When data is being displayed in Grow Timesmode, this checkbox specifies whether time-axis should grow to continuously show all data, or whether it should just show data for a fixed time period. FixedDuration The period of time (duration) that the time-axis should display when in Grow Times mode with DisplayFixedDuration set to True. If there are tracks on the Debrief Tote, a vertical bar is drawn through the plot at the correct time. If the current time on the Tote occurs before the earliest time on the Time-Variable plot then the bar is drawn at the minimum value, and drawn over the maximum value if the current time on the Tote occurs after the latest time value. The bar redraws itself automatically as the time in the Tote changes. By default the time-variable plot shows absolute times (e.g. 12:34.00). Some forms of analysis conducted with Debrief rely on the use of relative times. To show these relative times on the lower axis of the time-variable plot, select RelativeTimes from the time-variable plot property window. Once this mode is selected, times will be shown relative to the last time-zero value set. By default, the times are shown in a normal HH:mm:ss format, but the DateTickUnits drop-down list contains a number of display formats which specifically support presentation of elapsed times. Items are suitable for inclusion in a time-variable plot when they have both temporal and spatial attributes, so this includes tracks, individual locations and annotations, but does not include grids, scales, or background datasets.